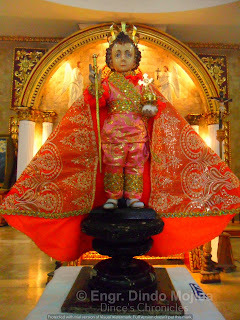 The statue’s vestments/garments of the Santo Niño de Ternate (Holy Child) are changed in the Pabihis (Dressing) ritual, which is performed by the Parish Priest, his invited Priests, the sponsor of the Pabihis and devotees inside the Parish Church right after the The Baña de Santo Niño de Ternate or the Rite of Bathing of the Holy Child held every December 31 or the last day of the year before the New Year. 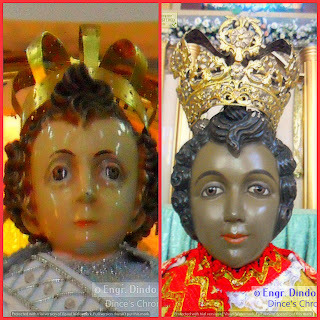 It is held annually and is attended by the public, most especially the devotees of the Santo Niño de Ternate. Pabihis is sometimes called Atavio. Atavio is a Spanish term which means robing or pagbibihis in Tagalog, to dress up or put on the vestments. The Pabihis, together with the Annual Bathing (The Baña de Santo Niño de Ternate) is an old tradition of the Mardicas, the ancestors of the people of the town of Ternate, Cavite which dates back on 1663. 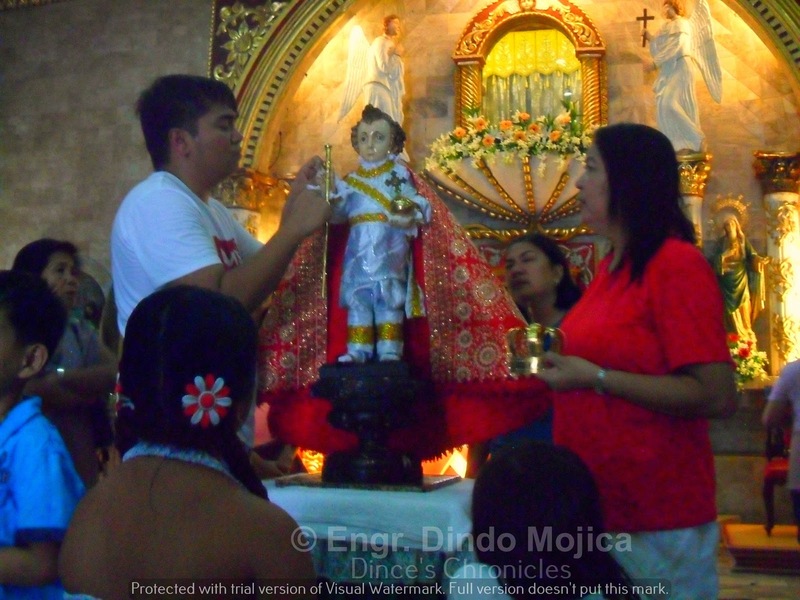 The Pabihis of the Santo Nino is also held every month but the most important event is on every last day before the New Year. 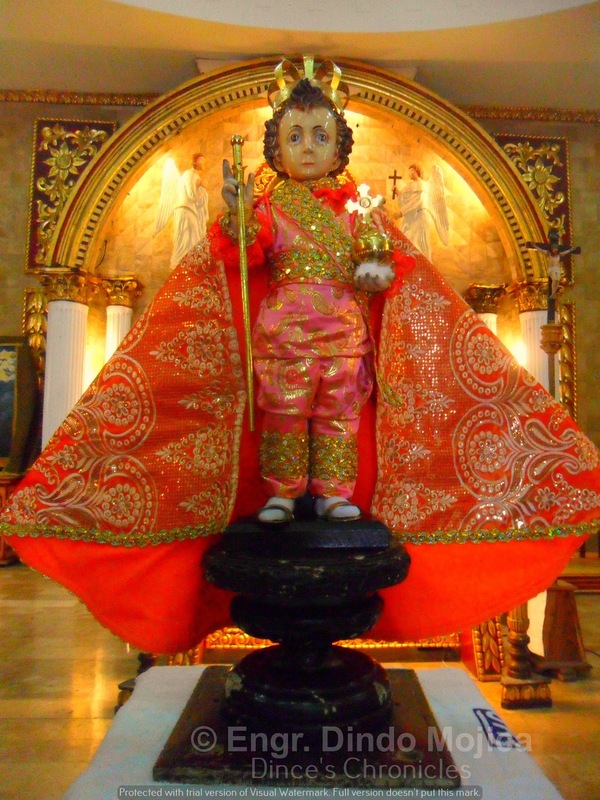 For the Santo Niño de Ternate Parish Church (Catholic), the schedule of their monthly Pabihis is held every Last Sunday of the month (please ask the Parish staff for the Sponsor’s schedule or scheduled event/depends on the schedule). 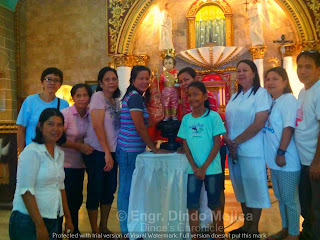 For the Santo Niño de Ternate Aglipayan Parish Church (Iglesia Filipina Independiente or Philippine Independent Church), the schedule of their monthly Pabihis is held every First Sunday of the month (please ask the Parish staff for the Sponsor’s schedule or appointed scheduled event). If you’re going to sponsor the Pabihis, you must go to the Santo Niño de Ternate Parish Church of your choice (Catholic or Aglipayan). You can make a reservation by registering if you’re interested to conduct the Pabihis based on an availability of slots or any scheduled date. 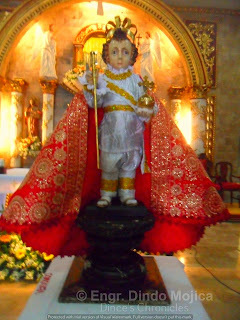 The Parish staff may recommend you to a Dressmaker who can make a Santo Niño de Ternate dress/garment/vestment of your preferred choice/design. 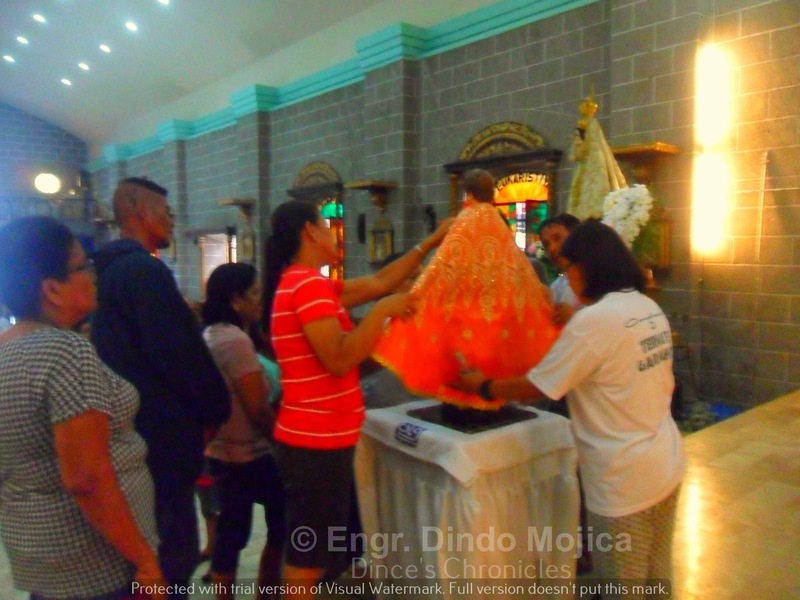 The Price of Dress/Garments/Vestments of the Santo Niño de Ternate started at P5,000.00 (depending on your design; just ask your Dressmaker for the details). I had experienced watching a scheduled Pabihis of the Santo Niño de Ternate last October 2, 2016 right after attending the Mass at the Santo Niño de Ternate Catholic Church adjacent to it. 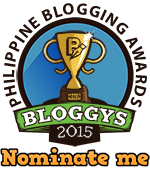 I was invited to watch and observe the rituals of the Pabihis the Aglipayan way. First, the Parish staff and the Sponsor of the Pabihis will bring down the statue of the Santo Niño de Ternate from the retablo going to the altar. 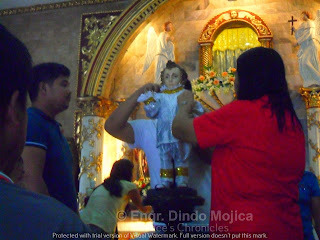 Next, you may take a photo of the statue of the Santo Niño de Ternate before the Pabihis. Next, the Camarera or caretaker will remove (initially) the (outer) vestments of the Santo Niño de Ternate. Next, the Camarera or caretaker will remove the inner garments of the Santo Niño de Ternate and afterwards, they will cover with a towel and clean it with water soaked in cotton (bulak). Then, the Camarera or caretaker will put the inner garments and the outer vestments of the Santo Niño de Ternate. 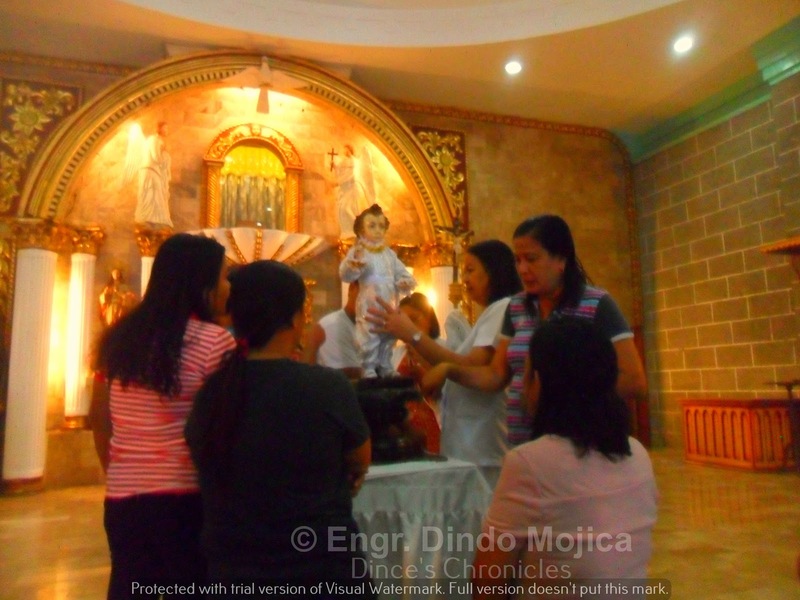 Finally, the sponsor will spray the perfume for the vestments of the Santo Niño de Ternate and will bring him back to the retablo thru the help of the Camarera or caretaker and the Parish staff. 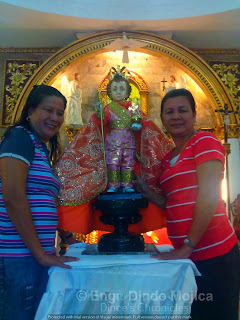 I personally thank Mr. Jefferson Jalmanzar, instructor at Cavite West Point College, a friend and a Parish Staff at the Santo Niño de Ternate Aglipayan (IFI) Parish Church for inviting me to witness the Pabihis scheduled for the month of October 2016; To Ate Rosalie “Yeyeth” Linayao, the Camarera, for the rituals and traditions of the Pabihis I’ve learned, the Aglipayan way. To Hon. Victor Santos, Councilor of the Municipality of Ternate, Cavite and his family, the Sponsor of the Pabihis for the month of October 2016, for allowing me to document and witness the Pabihis. To Ms. Imee Lipar for the video and to the YIFI most especially to Mr. Edson Catipon for helping me to document the Pabihis. 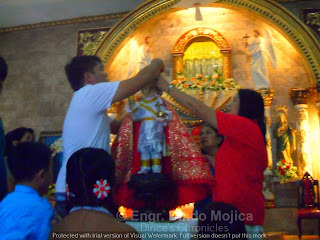 It’s almost the same at their counterparts in the Aglipayan Church except that the Camarero or caretaker will ask you if you can carry the image of the Holy Child and then you’re going to dance to it like you’re caressing or showing fondness to a little child before removing the vestments (depending on the Santo Niño de Ternate). 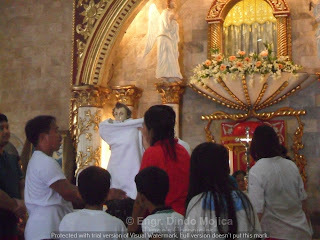 Usually, the Pabihis starts after the Second Mass (around past 9:30 in the morning). 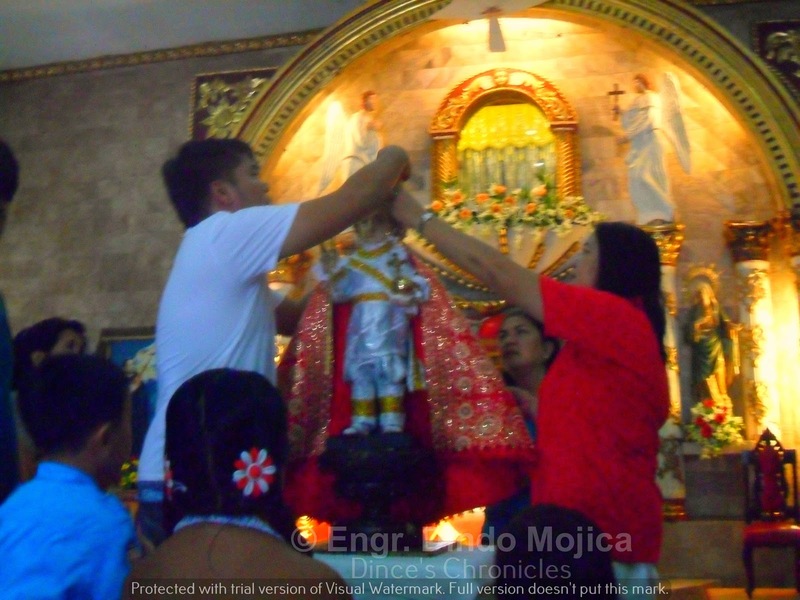 The Camarero for the Santo Niño de Ternate Parish Church is former Ternate Councilor Khalil Lorenz D. Soberano, current Parish Pastoral Council Coordinator. The other camarera/camarero are Ma'am Grace de Joya, Ma'am Benilda "Baby" Catalasan and Mr. Roberto Pascua, aka Kuya Abet.